Ah...the amazing Shrek phenomenon! Who would have ever thought that a big, green, animated ogre would stick around for so long and become so close to everyone’s heart? How did this come to be so? Well, I think the answer is pretty simple. It’s an animation both adults and kids can both love. In the cinema today, there were about as many children as there were adults and the appeal to both was staggeringly obvious. The kids loved the visual humour while the adults loved the verbal humour. Attending the cinema with two adults and two 4 year old children, I often found myself laughing with the adults when there was silence from the two young boys. It’s not just the humour though that makes Shrek so appealing. It’s also its originality, colourful characters and the cast of superstars behind the voices. All of which are carried on in “Shrek Forever After”. Do you remember your first trip to the movies? Honestly, I don’t. I went to the movies far too many times when I was younger to pick out my first flick. The earliest one I can remember is going to see “The Little Mermaid” at Village Cinemas at Sylvania, which has now been closed for many years. I had the pleasure of being in attendance at little Mitchell’s first film today. I’m not quite sure if he knew what he was in for, especially considering the film was in 3D! He wasn’t quite sure why he had to wear glasses and was over them about 15 minutes into the film. Although his mother did inform me that he was wearing them when he got into bed this evening! His first question when arriving at the cinemas was “Where’s Shrek?” He was very well behaved though and is looking forwards to his next movie. Does anybody have any first movie stories they would like to share? Don’t be shy! “Shrek Forever After” is another example of films this year dragging out a phenomenon as far as it can possibly go. It may be suggested that director Mike Mitchell decided to create a fourth instalment to the Shrek series of films in order to utilise the new rage of 3D. However, unlike other films which have done this, “Shrek Forever After” is still a ball of fun and Shrek looks anything but tired and worn. This film doesn’t bring anything particularly new to the table but is nevertheless fun to watch and enjoyable. Shrek (Mike Myers) has all he could possibly want in life. His wife, Fiona (Cameron Diaz) who loves him, three one-year old ogre children and friends who are always there for him. Yet, he can’t help but feel that life is just getting too monotonous for him. When he meets Rumpelstiltskin (Walt Dohrn), he decides to take him up on an offer to escape his life for just one day and go back to the days when he was a terrifying ogre, and not a friendly one. However, Rumpelstiltskin is not to be trusted and Shrek ends up losing more than he bargained for. Looking like a Shrek version of “It’s A Wonderful Life”, the plot of “Shrek Forever After” is a storyline that has been done over and over. No prizes for who guesses how the film finishes or what realisations Shrek makes. This isn’t as much of a pitfall in this film as it would be in a stand alone film. The Shrek films have always been more about the visuals and the witty one-liners than about the actual plot, which is exactly how this film is. The visuals in this instalment are even better than the other three films as they are enhanced by 3D and Mitchell uses every opportunity throughout the film to take advantage of this. There are some moments that leave the audience awe-struck with the capabilities of 3D presented. With each instalment, Dreamworks has managed to make Shrek more and more lifelike. 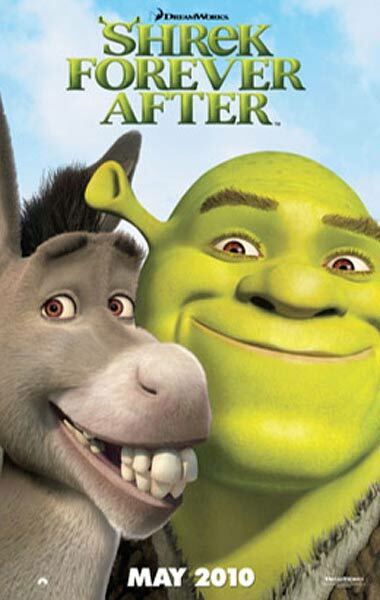 Thanks to 3D, “Shrek Forever After” is the closest to real life that Shrek will ever get. The script does also give some clever moments. Although it is not as funny as its predecessors, it still packs quite a few giggles into the film. The creativity that goes into making Far Far Away and the characters are once again what makes this film such a joy to watch. Such concepts as the tourist coach coming past Shrek’s house at the swamp much like a Star Tours bus in Hollywood are pure genius and just plain fun. Fiona has been transformed for this film and is great to watch as a female warrior princess. The inclusion of the green faced witches bring a dash of “Wizard Of Oz” to the growing fairytale land and are great to watch. However, the two best characters are Puss In Boots, who has piled on weight after being treated as a domestic cat and a character by the name of Butterpants who says very little but “Do the roar!” And who could ever forget Eddie Murphy’s waffle loving Donkey? No Shrek movie is complete without him. “Shrek Forever After” is a great film to go and watch for some harmless fun and humour. The film itself could have been made as a television special, but with the inclusion of 3D has made it a cinema spectacle. The amazing visuals and creative characters save this film from being lost in the whitewash of blockbuster sequels being released this season. The first film I ever saw in a theatre was Pinocchio, and my Grandfather took me. What sticks out in my brain is the way we were wickedly early for our show - so early in fact that when I excitedly ran in to the cinema, I saw moments from the end of the film (the previous showing was still wrapping up). As part of my podcast, I ask my guests what the first movie they can remember seeing was - makes for some pretty varied answers! I have no idea what I saw the first time I ever went to the theater, but the first film I REMEMBER seeing was Oliver & Company...which came out in 1988, so I was probably somewhere between 5 and 6 when I saw it.